About "ESV Single Column Journaling Bible Black (Black Letter Edition)"
This innovative Bible presents the full text of the ESV in single-column format. Every page has 5cm wide ruled margins for notes and reflections. The sturdy high-quality paper can take a variety of art techniques without bleeding through. Black letter. Hardcover. The ESV New Journaling Bible is a complete redesign of the original Journaling Bible. The Bible text is now laid out in an easy-to-follow, single-column format. Ruled lines in the extra-wide margins match up with each line of Bible text, enabling users to more easily align their notes with specific verses. With high-quality Bible paper and cover materials, the New Journaling Bible is a durable edition for anyone who wants to capture notes, prayers, or personal reflections in their Bible. 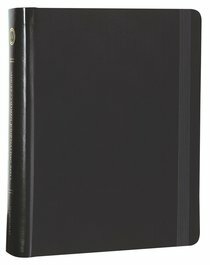 Customer Reviews For "ESV Single Column Journaling Bible Black (Black Letter Edition)"
Put simply you cannot get better than the Word of God, so in the grand scheme of things, almost any Bible you choose will be a good one. 4) ESV version: Once again personal preference, I personally like word for word translation but particularly handy in this Bible with the space to journal, you can expand upon the meaning and ideas alongside the verses themselves.